The Next Generation Science Standards includes feedback loops and homeostasis as a standard for life science. While homeostasis is a theme for many units in biology, feedback mechanisms are fairly specific. In fact, this is probably the most oddly specific topic found in NGSS. If you are trying to include it, most younger students can understand the concept when it applies to the body’s thermoregulation system, a negative feedback loop. Your body has a set point (around 98.6º) and when receptors detect that the temperature is getting too high or too low, then the body makes adjustments, such as sweating or shivering. More advanced students can take this concept further by applying it to the body’s regulation of blood glucose. 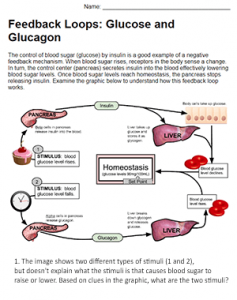 This worksheet shows a graphic of how insulin and glucagon work opposite each other to maintain’s the blood glucose levels at a set point. Changes in the environment, such as those that happen after you consume sugar will cause the pancreas to release insulin so that the glucose can be taken up by the body’s cells or converted to glycogen. When the blood sugar declines, as a result of hunger, the liver may convert glycogen back to glucose. Students must examine the graphic and answer specific questions about the feedback loop depicted. How can I find an answer key to this worksheet? I would also like the key for the feedback loop with insulin and glucagon! I also need a key for the Feedback loops: insulin and glucagon. This answer key is available at Teachers Pay Teachers: https://www.teacherspayteachers.com/Product/Feedback-Loops-Answer-Key-3849678. Student handouts are always free.